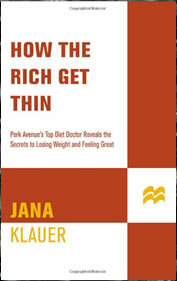 Park Avenue doctor Jana Klauer wrote How the Rich Get Thin in order to share the secrets of how she helps her rich clientele to lose weight. Klauer promises that everyone can get thin by following her program, which involves a strict regime of daily exercise and a diet based on high protein and whole foods. The basic structure of the diet is high protein, low carbohydrate with the elimination of processed foods including nutrition bars. High quality proteins are included in every meal and carbohydrates are very limited except in the later phases of the diet. A major element of the diet is the emphasis on a high calcium intake, which is achieved by eating large amounts of low fat dairy foods. Calcium supplements are also recommended. Phase one involves an extreme high protein, low calorie diet for three days. This phase is designed to jump start weight loss as excess water is released. Phase two is based on high quality proteins such as eggs, fish, and dairy. Dieters are allowed three meals and three snacks daily. This phase is to be followed until dieters are within five pounds of their goal weight. Phase three is where dieters gradually reintroduce foods so as to move towards a maintenance diet. In the first week of this phase dieters can add organic chicken. In week two fruit is reintroduced. Legumes such as garbanzos, peas, and lentils are allowed in week three and in week four dieters may include sweet potatoes in their meals. In week five nuts are added to the diet and in week six whole grains and breads may be consumed several times a week. If dieters notice a gain in weight while experimenting with the reintroduction of foods then the offending food is to be eliminated from the diet. Low fat dairy products, salad greens, low carbohydrate vegetables, berries, endamame, hummus, salmon, shrimp, omega 3 eggs, organic chicken, caviar, and green tea. Look for more high protein and low carb recipes here. Exercise is a vital component of the program and dieters are advised to do an hour of aerobic exercise every morning. Try these exercises with How the Rich Get Thin. How the Rich Get Thin retails at $13.95. There may be an increase in grocery expenses due to the requirement for high protein and organic foods. Adequate guidelines provided for meal creation and good tips for eating out. Emphasizes importance of exercise in a weight loss program. Wine is allowed in moderation in maintenance phase. Provides unique information regarding how some prescription drugs can cause weight gain. Includes interesting and flavorful recipes. Highly restrictive and eliminates many foods. Calories are very low in the first two phases and most dieters will feel hungry or fatigued. Makes no allowance for individual calorie requirements. Exercise recommendations will not be appropriate for many dieters. Excessive emphasis is placed on high impact aerobic exercise such as jogging. Claims regarding the ability of an increased intake of calcium to promote weight loss are disputed by many nutrition experts. Includes foods that many dieters may not be familiar with as well as some that are beyond the financial capacity of most individuals. May be difficult to follow for those that are allergic or intolerant to dairy products. Many dieters may not be able to relate to the Park Avenue mindset that is presented in the book. This plan is likely to be very effective in regard to weight loss for dieters who follow the guidelines in the book, however, the first two phases of the diet are far too restrictive. This increases the risk of rebound weight gain when calories are increased and a greater variety of foods are reintroduced. This is the most effective diet my husband has ever tried. twice on the weekends hasn’t seemed to alter his weight loss.